new york art photography Manhattan Bridge, originally uploaded by Daniel A. Norman. Description: New York Street Photography in black and white. 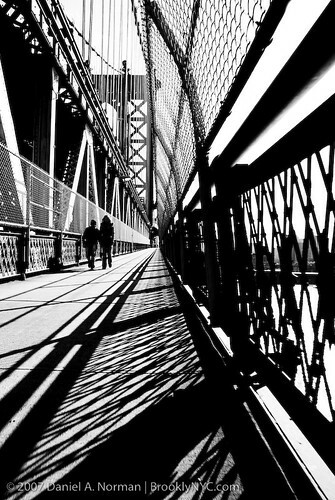 A street photograph of Manhattan Bridge in New York City by Brooklyn New York artist / photographer Daniel A. Norman. The Manhattan Bridge recently re-opened its pedestrian walkway, so now I can work on some New York photography from a different perspective. This was actually my first time walking over the Manhattan Bridge, and I have lived all 27 years of my life in Brooklyn, New York City. The Manhattan Bridge is really nice, but the Brooklyn Bridge has always been my favorite New York Bridge. The Brooklyn Bridge has also been a main subject in some of my art and photography. Even though I love the Brooklyn Bridge, I also love the solid metal and blue steel of the Manhattan Bridge. As I walked over the Manhattan Bridge to take some photographs, I noticed that Manhattan bridge constantly vibrates. The vibrations get really strong when a huge truck or a train goes by. These constant vibrations make the Manhattan Bridge feel much less stable that the Brooklyn Bridge. The only reason I still felt safe was because I knew that the vibrations were part of the design of the Manhattan Bridge. I remember something from my days as an engineering student. Before I was brave enough to follow my heart and pursue a career as an artist, I was headed towards being an engineer. I was a mechanical engineering major at Brooklyn Tech High School and then an electrical engineering major at City College. I switched my path from engineering to computer science, then after receiving a degree in computer science, I continued my studies of computer science at Brooklyn College. Brooklyn College is where I decided to switch my focus to art and become an artist. Engineering, computer science, and art can be closely related subjects, but art without the strict rules of science allows for greater Artistic Liberty. As an emerging artist, I really love working in several areas of art including photography, painting, printmaking, and sculpture. I also do clothing design and screen printing for BrooklyNYC.com, a New York Lifestyle brand I co-founded in 2006. Recently I've been working on paintings and street photography, which was the reason for my walk over the Manhattan Bridge. As I continued my walk across the Manhattan bridge, the bridge kept trembling. The trembling was trying to blur my shots, but I switched my Nikon D80 from landscape to Aperture, to Manual mode, and back to landscape. By the time I got off the Bridge, I was back in Manual mode and I knew I had some nice images. Crossing the Manhattan bridge might be a great activity for those visiting the great New York City, but it feels special to me because it means returning home to Brooklyn. I enjoyed walking over the Manhattan Bridge and here is a black and white New York street photograph that really captures the feel of the Manhattan Bridge and of New York City. Feel free to leave comments. For some reason, more comments are left at Brooklynlens.com than here.